For a long time, page-builder plugins that offered drag & drop functionality along with lots of preformatted options have been the standard for those who wanted to really customize their WordPress pages & posts. This was largely due to the fact that the WordPress editor is fairly limited. The new Gutenberg WordPress Editor may be set to change all that and make some of those other page-builders step up their game. This post isn’t a how-to for Gutenberg – you can find that here. In its current iteration, Gutenberg is a work in progress. The conceptual foundation, however, has already been nailed down. The new editor will use blocks as its primary content unit. Anyone who’s worked with WordPress knows you don’t always have all the tools you wish you had. The editor for posts has most of the basics, but it’s not as varied as something like Microsoft Word. There are some new features I really like. These new features eliminate plugins and make the writing experience flow better. By far, my favorite new item in the editor is the ability to create columns. Prior to Gutenberg, columns in content had to either be coded manually with div and float tags, or you had to use a plugin. Both options have their limitations, especially on different screen sizes. Being able to add columns to a block of post natively will help eliminate some headaches for content managers. Right now, they’re not perfect. The padding between columns is a bit small in some themes the responsiveness could be better. Again, it’s a work in progress. Tables are another feature that has been sorely missing from WordPress. Just like with columns, you had to either write out the HTML for a table or install a plugin. Having tables available in the core editor will help eliminate the need for additional plugins such as TablePress. When you want to embed a YouTube video or some other type of media into your site, typically you have to find the embed code and copy/paste it into your article. Then you have to perform the sometimes tedious task of adjusting the size tags to make it how you want it. With Gutenberg’s built-in media embeds, it’s super simple. 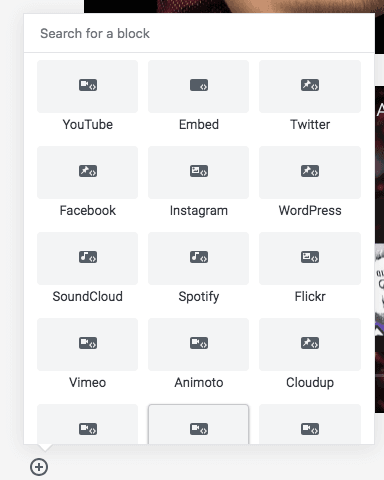 The embed menu features just about every major media site, just select which one, enter the link and that’s it! Another nice feature of Gutenberg is the ability to add a caption to an image without switching to the media screen. As soon as you insert an image in a post, the caption area is open for editing right in the visual portion of the editor. It’s a good time-saver and helps you stay focused on the flow of writing instead of having to go off-screen for captions. SEO folks know that every image in a post should have alt text assigned to it. And just like adding a caption to an image before Gutenberg, you had to screen swap to the media editor to do it. Gutenberg makes alt text much easier. Anytime an image is selected in the editor, the right-hand pane automatically changes to the image tools which includes alt text. Gutenberg will allow you to keep writing without having to go off-screen to modify or change alt text. Like any major change, the Gutenberg WordPress editor will probably leave some folks dismayed. Resistance to change, right? The good thing is that Gutenberg is still being developed. That means WordPress users really will have some input. One feature I’d like to see is the ability to drag and drop blocks vs. using arrows the move them up/down in the layout. For those of us who know the old editor like the back of our hands, the adjustment to Gutenberg could come with some snags. Overall for folks who are just learning WordPress, Gutenberg might actually be easier and more intuitive. 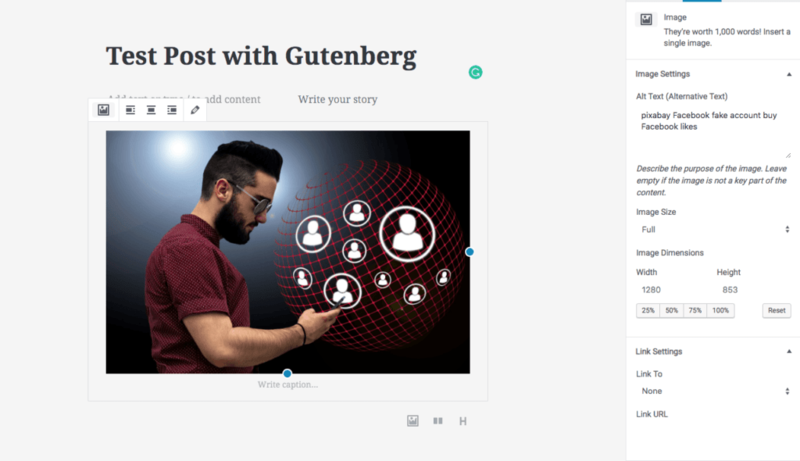 If you have a WordPress site, especially if you write a lot, I’d highly recommend installing the Gutenberg WordPress editor on a test or staging site. That’ll help you get used to it and see if it conflicts with any of your existing plugins. Conflicts and bugs can be reported to Gutenberg’s GitHub repository. At the time of this writing, WordPress will include Gutenberg as part of its core staring with version 5.0. You’ll still be able to install the original editor as a plugin, but one can only expect that to be supported for so long. Personally, I’m looking forward to the new features. I’m also somewhat dreading the possibility of having to go back and modify my old posts and articles.